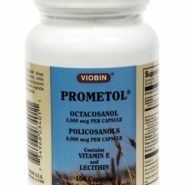 Prometol® contains a unique concentrate of wheat germ oil, with a high concentration of fatty alcohols supportive to nerve and brain tissue. Purchase this product now and earn 4,517 Reward Points! A potent source of Octacosanol (1,500 mcg per capsule) as well as other policosanols (2,000 mcg per capsule). OTHER INGREDIENTS: VIOBIN® Wheat Germ Oil, soy lecithin, edible vegetable wax, d-alpha tocopherol (derived from natural vegetable oils) and gelatin capsule. 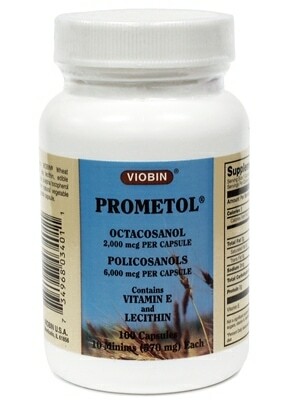 Prometol is a natural extract of plant waxes called policosanol, the most active component of which is octacosanol. What is Prometol used for? Prometol may reduce serum cholesterol and LDL in some persons. It also appears to have significant effects on the reduction of platelet aggregation. What are the side effects of Prometol?